ePublishing Knowledge BaseePublishing Knowledge BaseePublishing Knowledge Base Managing the websiteHow do I control which default image is shared with social media? 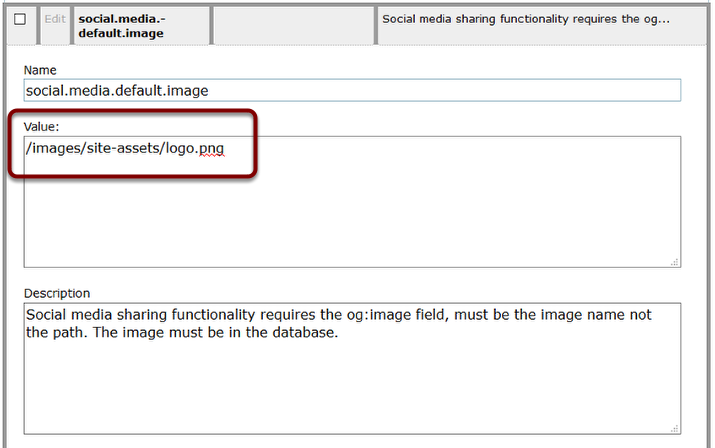 Whenever someone shares a link for your website on social media, an image can be shown. For content such as articles, products and even events, the shared content will include the image you placed in the Featured Image field of the relevant tool. But what about all of those pages on your website where there is no "featured image"? And what about articles and events you didn't have a featured image to show? We've got that covered with a default social media image. If you want this to be your website's logo, great. If you would prefer this be something else, that's fine too. We strongly recommend this be a PNG image and be of good quality and reasonable file size. Click on the sub-directory you wish to place the image in. You'll need this later. You may place your image in any sub-directory. Site-assets is just an example. Click new file and upload your PNG image. 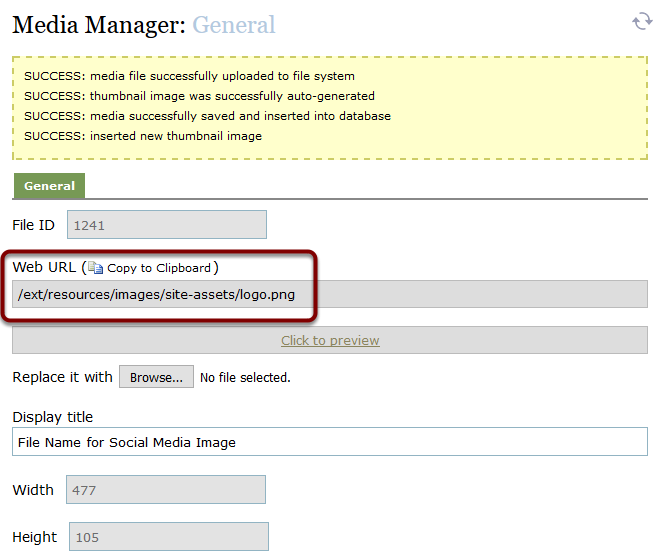 Learn how to upload new media to the media manager: How do I upload new media, such as photos, videos and files? After clicking Create, copy the URL of the image you'd like to use. 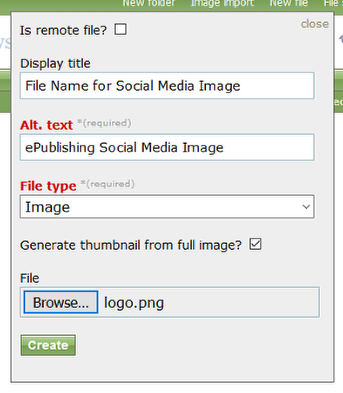 Exit the media manager, and go to the System Settings to finish setting up your social media default image. Click Edit next to social.media.default.image to update. Zoom: Click Edit next to social.media.default.image to update. Paste the path you copied in the Media Manager under Value; delete /ext/resources at the front of the URL. IMPORTANT: There is no need for the FULL Web URL path here. Omit /ext/resources if you copied the web URL in the Media Manager. Prev: How can I control my 404 or Page Not Found page? Next: How do I confirm my site on Google Webmaster, Bing Webmaster, Pinterest and other sites?